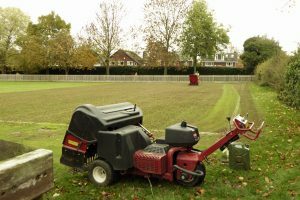 After many months of discussion with the Council about lawn maintenance, work finally started earlier today on Sunday, 4 November, when hollow tining was completed on all four lawns. The photographs show the start of work on Lawn 4, the solid tining and soil core collector machines, the tining holes which have now been drilled across the whole site, and four piles of soil cores amounting to over eight tons awaiting removal. Later this week or early next week, depending on the weather, the plan is to apply about 10 tons of top dressing and autumn fertiliser. This level of treatment is recommended every two or three years but has not been done for some years. 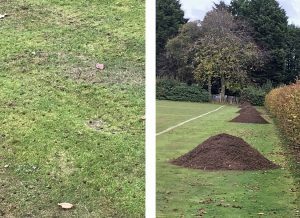 It will complete the planned autumn maintenance work and the lawns will then be allowed to rest to avoid compaction and to enable the maximum penetration and absorbtion of moisture down to the roots of the turf which became dehydrated during the summer drought. The annual programme includes further work in the spring at the start of the season followed by regular maintenance throughout the summer playing period. A key objective now is to ensure that the park’s watering system is repaired and made properly operational for next year so as to avoid the lawns drying out in the event of another spell of warm, dry weather. Hopefully this will mean that we can all look forward to the lawns being in a much improved condition next season.